why should I speak to a lawyer/solicitor? what do I do if I am not happy with my lawyer? Personal injury is a complex area of the law so it is important to use a specialist to ensure your compensation claim is handled properly. You might be approached by unqualified non-specialists, who may only be interested in obtaining a percentage of your compensation and not in providing you with the best or most appropriate legal assistance for your particular needs. Care should be taken, as these companies may not be able to give legal advice: often acting as middlemen, passing your case on to someone else to handle. An APIL accredited lawyer is committed to acting in your best interests. He or she will explain how much compensation you may be entitled to and will always give you clear and honest advice with your welfare in mind. APIL accredited lawyers are specialists and receive ongoing training to make sure they are always up to date with the latest developments in personal injury law. Senior Litigator – usually five or more years’ experience, running their own personal injury caseload, and competent to lead and supervise the work of other PI lawyers. Fellow – an APIL Senior Litigator, usually with over ten years’ experience, with a high level of technical expertise in personal injury law, including trial procedures, and who is recognised by their peers as being in a position of professional and intellectual leadership. Senior Fellow – an APIL Fellow who can demonstrate outstanding contributions and accomplishments in personal injury law and practice. Brain injury, clinical negligence and/or spinal cord injury specialist – an APIL Senior Litigator or Fellow who has demonstrated further competence in these specialist fields. Claims management companies (CMCs) usually act as middlemen, not actually handling claims themselves, but passing them onto solicitor firms. Claims management companies are regulated by the Ministry of Justice. There is no form of accreditation governing the practices of claims management companies at this time. A law firm is regulated by the Solicitors Regulation Authority (SRA) and the barristers they may instruct on your behalf are regulated by the Bar Standards Board (BSB). APIL accredited lawyers will be able to answer these questions and are committed to putting your best interests first. They will listen to the details of your injury and advise whether they will be able to take on your case and how likely your case is to succeed. APIL accredited injury lawyers will keep you updated about all aspects of your case, this may take the form of progress reports. Most successful cases settle through negotiation between your solicitor and the solicitor or insurer representing the defendant. However, occasionally issues arise that might be more difficult to resolve because the parties do not agree. In these circumstances your lawyer should discuss with you all potential methods of resolving your claim where this is appropriate. This could be through mediation, a joint settlement meeting, early neutral evaluation or trial. A joint settlement meeting or JSM is a meeting to discuss your case with the aim of reaching a settlement. This meeting usually takes place once court proceedings have started. The typical process for one of these meetings is that you and your legal team (your solicitor and – if you have one – your barrister) will sit in one room, whilst the defendant’s legal team sits in another. Your solicitor and barrister will then meet in a neutral room with the defendant’s solicitor and barrister to discuss the case. Your legal team will then report back to you on discussions and any settlement offers. This process involves a neutral and impartial mediator to help settle the claim. A mediator is not a judge. They are experienced in working with parties who disagree to help them find their own solution. Mediation is a flexible process. It will usually start with a joint meeting where each party is asked to explain its view of the case. You can ask your solicitor to do this for you. Questions can then be asked by all parties, including the mediator, to ensure that all key issues have been raised. The mediator will then meet privately with each party to explore possible solutions. If an agreement is reached, it is written down and signed by both parties. The mediator’s fees must be paid by both parties or by agreement between them as to who should pay. These can be expensive and mediation is not always the best method to resolve a case. Your solicitor should advise you whether mediation is suitable for you. This is a process where your legal team and the defendant’s legal team meet before a neutral third party - usually a senior lawyer (solicitor or barrister) who is independent from yours and the defendant’s case but is experienced in personal injury litigation. Your legal representative and the defendant representative will outline their case. The evaluator will then identify the main issues in the case, assess its merits and if possible, explore settlement options. If settlement is not going to be possible the evaluator may still be able to assist in narrowing other ongoing issues in the case, resulting in quicker resolution overall. Arbitration is a formal process similar to litigation. It involves much of the argument and procedure that occurs in a court trial, but offers greater flexibility, as parties can choose when and where to hold the arbitration. The parties also choose and agree on the arbitrator, who will be an industry specific expert, for example a senior barrister specialising in personal injury. Hearings are in private, and the arbitrator’s decision is binding, as long as it follows a properly written arbitration agreement. Arbitration is most commonly used in commercial and shipping disputes at present, but there are now specialist personal injury arbitration services available. Your solicitor will advise if arbitration is the right process for your case. Your solicitor will have already prepared all evidence relevant to your case. Your lawyer will represent you at trial. Your lawyer will open the proceedings, setting out brief details of your case. You may then be called to give evidence along with any other witnesses to support your claim. You and your witnesses will be asked questions by both legal teams and possibly the judge. Medical experts may be called to give evidence if there are contradictions in evidence that the judge needs to address. In the majority of cases the judge will give his decision on the same day or very shortly after the trial, although if the case is legally complex, the judge may decide he needs more time to make his decision. Whether or not the defendant accepts responsibility for causing an injury, your lawyer may advise you to make an offer to settle (or conclude your claim) for an amount of compensation. The defendant may agree to settle for the amount requested or make a counter offer to your lawyer for a different amount. If this happens your lawyer will advise you on whether it is in your interests to settle for that amount. Offers can be made by either party at any time up to trial, and even during a trial before the judge has given his decision on the claim. However because the defendant will be conscious of the rising cost of legal fees that they are likely to have to pay if your case is successful, it makes sense for them to try and negotiate a settlement before the trial. Firstly a judge will take responsibility for your case and you will be given a date for your hearing. 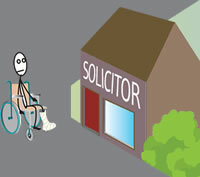 Your solicitor will make you aware of any preparation you need to make. For most people, going to court can by worrying but by this time your lawyer will have prepared you case in detail and it will simply be a case of waiting to find out if you have won. Your accredited lawyer will look after you all the way. If you win, you will be awarded an amount of compensation, some of which may be used to pay legal fees. In the event that you do not win, your costs may be paid for by an insurance policy and your lawyer will be able to explain how this works.